A trance-like journey both eclectic and innovative, soulful and seductive. With Swaha’s evocative melodies and beautiful ambient textures, Meenakshi’s voice sends you soaring…a must for yoga class, trance dance and more. SWAHA performs music that is both inspired and uplifting. It is an enticing blend of ethereal Sanskrit vocals soaring over rich earthy rhythms. The songs are composed by Meenakshi and Ron Reid. Swaha invited the soul to sing, and Meenakshi and Ron and the grooves of the band are contagious! Meenakshi's experience with chanting began in 1988 on her first trip to India to study in the Himalyas yoga philosophy and meditation. Her background was in the performing arts, but her Bhakti (devotion) for God came through her experiences of meditation and chanting. She recorded her first CD of Sanskrit chants in India in July 2000 entitled "Prayers". Since then she has been leading kirtan, chanting workshops and classes, meditation, yoga philosophy, Sanskrit and Ashtanga and Restorative Yoga in Canada, the U.S. the UK and Europe. Her voice has a sweet, ethereal and open-hearted quality, full of devotion and surrender. Ron Reid is co-owner and director of Downward Dog Yoga Centre in Toronto, Canada (www.downwarddog.com). Prior to the opening of Downward Dog in July 1997, he spent many years in the music business performing and writing music for performance, film and dance. His music influences are vast, and his connection to the spirit and soul of music is seen in his deep understanding of Yoga both on a physical level and etheric level. He bridges Hatha Yoga and Nada Yoga (the Yoga of Sound) effortlessly. Currently travelling internationally sharing their love of music and the art of yoga, Meenakshi and Ron enjoy the opportunity to dive into the depths of a complete practice with people, filled with Bhakti, laughter, the beauty of the physicality of the yoga practice as well as the deep philosophical basis for it's existence. 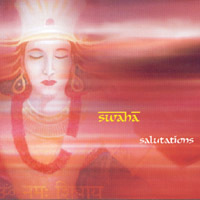 Their CD released in 2002 "Salutations" is widely available, and they have currently released their new CD for yoga practice and trance dance entitled “VISHNU’S DREAM”…now available! Just listening to this CD makes me so incredibly happy!!!. Meenakshi...I am listening to Vishnu's Dream while I am painting and it is absolutely GORGEOUS! I am in a trance.....!!! classes. One hour of pure yoga listening bliss - highly recommended!" 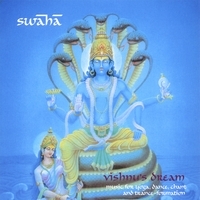 I play Swaha's "Vishnu's Dream" constantly - during reiki sessions and yoga at home, and while doing house chores. It soothes and enlivens and cleanses and calms. Absolutely graceful!